I start with that famous quote from A Farewell to Arms because, in a strange way, it speaks to how I feel about the Eiffel Tower (and other major landmarks similar to it in different cities). When I visit somewhere, I’m not all that interested in going to see the big thing that every tourist is told they have to see. I would rather go into a specific neighborhood, have something to eat, get coffee or a drink, walk around and watch the people. When I travel, I’m less of a sight-seer and more of a city-experiencer. I’ve been to New York many times and yet haven’t been to the Empire State Building or the Statue of Liberty. Those “abstract” experiences with huge landmarks pale in comparison to the more “concrete” ways of experiencing a different place. 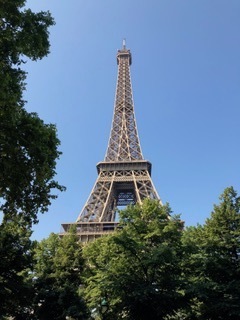 While I knew that the PEN/Hemingway fundraiser at the Eiffel Tower would be a good time, I was not as fixated on getting to go to the Tower itself nor was I particularly excited about seeing it. Yet as we all walked over from the Combes building and the Eiffel Tower became more and more prominent in the city scape, my cool stance began to disappear. I could not help but look up at it in wonder as we drew closer and get excited about seeing such an amazing and remarkable piece of architecture and one of the great international landmarks. But seeing this famous structure wasn’t the only reason I was at the Eiffel Tower on Monday. There were also Hemingway-related goings on and I made my way up, along with my fellow conference participants, to Le Salon Gustave Eiffel in the Tower itself for an afternoon filled with interpretations of and engagements with Hemingway. 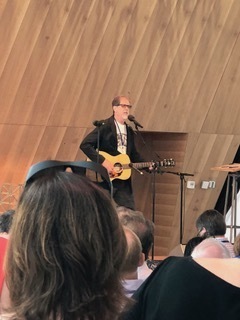 There were musical selections, including songs written about Hemingway and Paris by Michael Kim Roos and Sarah Gannon. Though they were both about Hemingway, each song took a radically different form. Michael’s song was very much in the folk song tradition while Sarah’s song about Hemingway and Paris was a sultry number well-suited for a jazz club. Ms. Gannon also treated us to a second song, a lovely rendition of “I Love Paris” by Cole Porter. 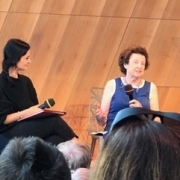 When there wasn’t music, there was interesting conversation that came in the form of Lesley Blume and Valerie Hemingway discussing Valerie’s experiences with Hemingway as he returned to Paris to “fact check” things as the prepared the manuscript of A Moveable Feast. 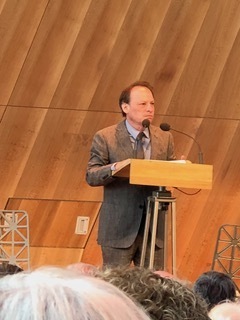 We were also treated to some brief remarks by Adam Gopnik, whose discussion of what exactly Hemingway and Paris means to everyone gave us a preview of what we can expect from his plenary talk on Tuesday, July 24th. Poetry was also on the schedule on Monday, as Donald Junkins, Matthew Nickel, and Ron Smith all gave readings that returned to this idea of Paris and Hemingway. The afternoon was topped off with selected presentations by students on why they love Paris and Hemingway, Stoney closed things out with some brief selections from his book Hemingway’s Paris: Our Paris?. And with that, we made our way back to the ground to walk back to the AUP for the first panels of the conference. Getting to visit (or re-visit) one of the great landmarks in all the world and spending an afternoon there in that most unique of places as we all celebrated the life, work, and impact of this author we all care so much about? That was a lovely way to spend a day at an academic conference and is the kind of thing you’ll only get to do with the Hemingway Society.